"American Idol" winner Scotty McCreery makes history as his debut album, "Clear as Day," bows at No. 1 on the Billboard 200 chart with 197,000 sold, according to Nielsen SoundScan. 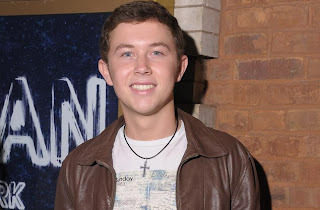 McCreery is the first country act to debut at No. 1 with their first studio album, and at 18-years old, the youngest man to open at the top of the chart with their debut release. Previously, the youngest male to bow at No. 1 with their premiere album was Omarion **, who was 20 when "O" started at No. 1 in 2005.Surprisingly, McCreery, who turned 18 on Sunday (Oct. 9), is also the first "Idol" winner since 2003 to hit No. 1 with their first studio set. Ruben Studdard ** was the last "Idol" champ to start their career with a No. 1 album, when his "Soulful" entered the tally dated Dec. 27, 2003, with 417,000 sold. Kelly Clarkson **, the original "Idol" champ, also bowed at No. 1, with "Thankful" on May 3, 2003 (297,000). "Clear as Day" also marks the biggest debut sales week of any "Idol" winner's first album since 2008, when David Cook's self-titled set started with 280,000 at No. 3. Kris Allen ** saw his eponymous 2009 debut launch with 80,000 (No. 11) and in 2010, Lee DeWyze **'s "Live It Up" arrived with 39,000 (No. 19). Scotty McCreery returned to the Grand Ole Opry Tuesday night for the first time since making his debut on the Nashville radio show in June. "There's no place like this," he said backstage. Tuesday afternoon during soundcheck, Scotty tweeted a picture of the circle of oak wood from the Ryman Auditorium, the Opry's regular home from 1943 to 1974, that now rests at center stage at the Opry House. "You feel the history, and all the greats that have played here before me," he said. Scotty made his Opry debut in June, just a couple weeks after winning American Idol. That night, he sang I Love You This Big and Check Yes or No. "I just remember the grin I couldn't get off my face when I was singing," he says. "If you look at pictures from that night, all you see is smiles from me." On Tuesday's show, Scotty performed his new single, The Trouble With Girls, and That Old King James, the final song on his Clear as Day album. "I thought the Opry crowd would enjoy it," he said of the choice. "It's a more traditional crowd than some of the other venues." Check out today’s New Country Challenge. It’s Brad Paisley vs. Scotty McCreery!